Minute displacement of metallic objects can be accurately measured with a resolution of 0.04 % F.S. 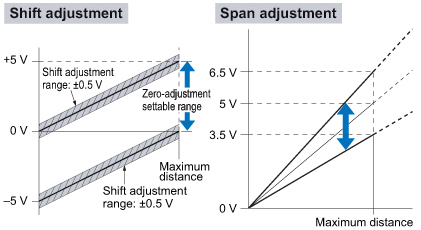 Displacement is accurately output since it incorporates a high accuracy linearity correction circuit. With IP67G environment resistance, various measurements are possible under many different conditions. These sensor heads boast a 2 mm 0.079 in or more sensing range enabling 0.03 % F.S./?. (Excluding the different frequency type). Temperature characteristics: 0.6 μm/? 0.024 mil/? This function comes in handy when performing tolerance diagnosis of a masterwork to be used as the standard. Easy adjustment for product changes. Fine adjustment according to the sensing conditions is possible with shift and span functions. If mounting standard types and different frequency types parallel to each other, they use up one-third the space needed for mounting compared to the same models. In addition, the GP-A14F type can be mounted close together and the sensor heads can be set in a narrow range for distortion and other difficult measurements.